You have TWO WEEKS to play along - Deadline to enter is Friday, April 5, 2019 at Midnight CST. The winners will be announced on the NND blog the following Monday. Becky Noelle creates this amazing Easter scene! She uses the Floral Lace stencil to create a beautiful textured background. For the those sweet critters from the Woodland Spring stamp set she uses the no line coloring technique. She uses the Land Borders die to create the pretty grass. Her amazing ability to color with use light inks makes this a truly amazing card! 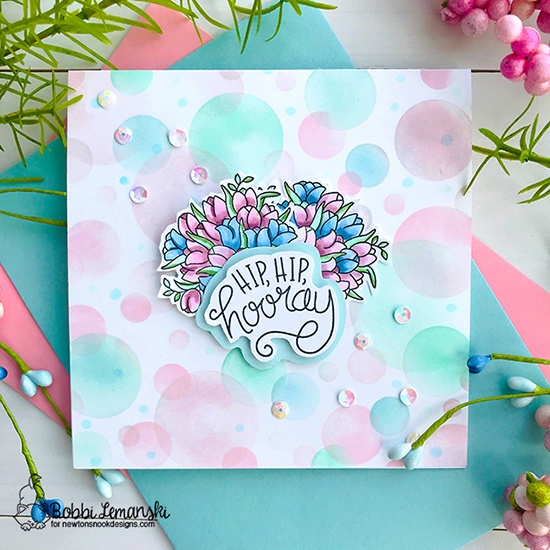 Bobbi Lemanski designs this amazing card that features this amazing background using the Bokeh stencil set. 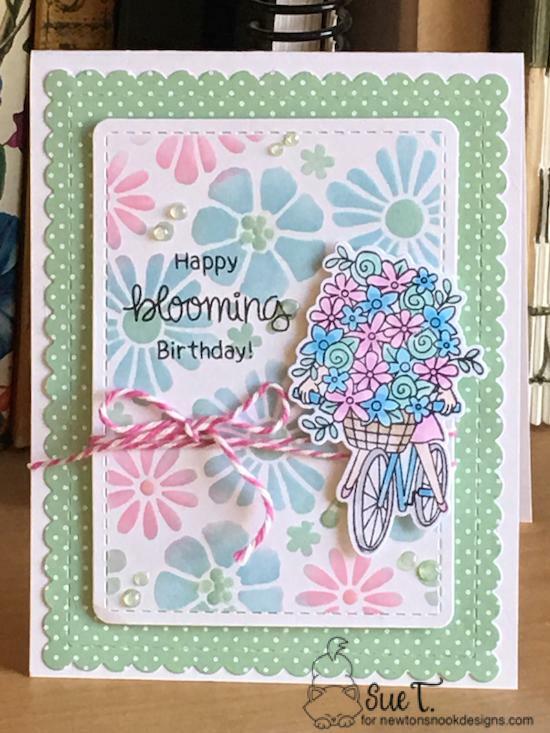 She then creates this amazing floral bouquet using the flower bunch from the Loads of Blooms stamp set. The sentiment she pairs up with her bouquet is from the Uplifting Wishes stamp set. A sprinkling of sequins provides the finishing touch! 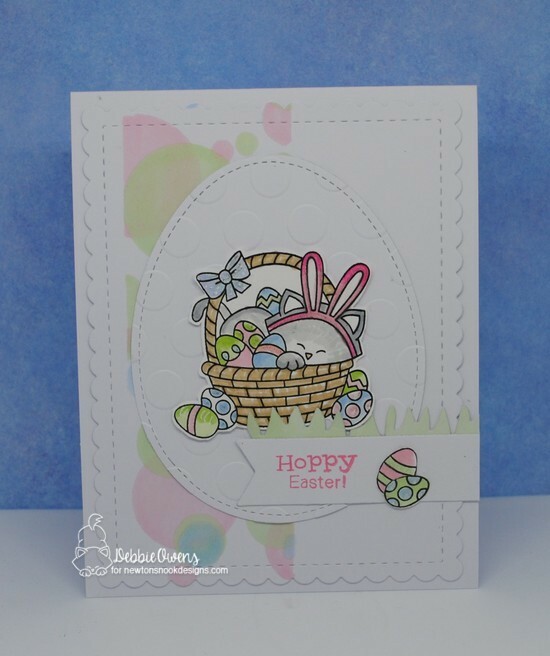 Debbie Owens creates this soft, sweet Easter card. Using the challenge's colors and the Bokeh stencil set, to create her vertical striped background. She die cuts it using the Frames & Flags die set. She then embosses another layer and die cuts in an egg shape. For her focal point, she lightly colors the Easter kitty from the Newton's Easter Basket stamp set. She adds some grass to the banner which she stamps a sentiment from the Bunny Hop stamp set. Diane Morales creates these darling potted plants! She creates these fabulous flowers by using the Flower Trio die set. She attaches them to paper straws and adds a banner using the Frames & Flags die set on which she has stamped the For You! sentiment from the Thankful Thoughts stamp set. 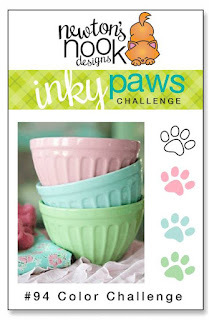 Such a fun way to add spring to one's household! Sue T. creates this amazing floral design by starting with a green polka-dotted pattern paper die cut from the Frames & Flags die set. Using the challenge's colors, she creates the floral background using the Bold Blooms stencil. She adds pink & white twine before adding the sweet girl from the Loads of Blooms stamp and die set. A few enameled dots add a perfect finishing touch!